For the peanut sauce, combine all ingredients in a mason jar and ensure lid is tightly sealed. Shake until all ingredients are thoroughly combined. For the slaw, mix the lime juice, apple cider vinegar, fish sauce, Tamari sauce, honey and Sriracha together. Add the cabbage and carrots and mix well. For the Sriracha Ketchup, combine ketchup and Sriracha sauce. Bake fries to specified package instructions. Heat up grill to medium heat (400 degrees). Score each hot dog 3-4 times on one side. Toast the hot dog buns, cut side down on the grill for 30-45 seconds, watching them closely. Place 1 ounce of slaw on the bun. Add the grilled hotdog and fries. Then drizzle with Sriracha ketchup and Pad Thai Sauce, garnish and enjoy! 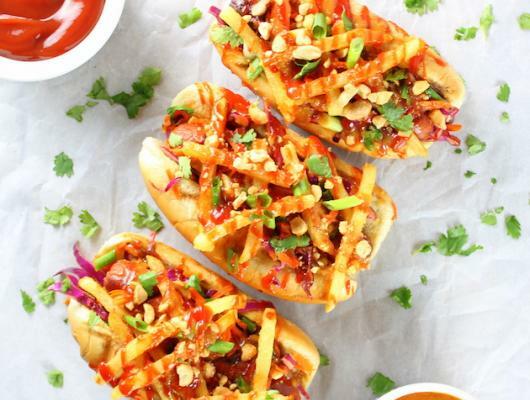 The Pad Thai Fry Dog! 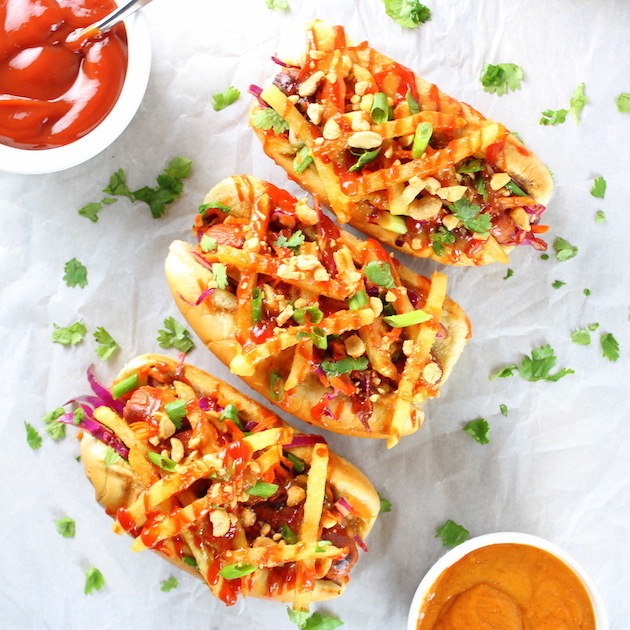 With tangy cabbage slaw, spicy Sriracha ketchup, creamy peanut satay sauce, & crispy French fries...this dog has it all!